It is one of the twenty-four seasons (Solar term) in the old calendar "Shunbun (spring division or center)" on March 21. As for this, length of Night and Day is the same day. It is a sign of the full-scale spring in the Far East. Today is called "Higan", too. It is a Buddhist holiday celebrated in Japan. Higan means a state of the realization that escaped from worldly desires. The cherry tree has begun to flower from the south area. Cherry blossoms flowering map of this year. The place of a famous cherry blossoms information and etc. I am very sorry that there is not English version. It is a very short interval, but let's enjoy the beauty of the cherry tree with all of you. These three of them are registered as the first natural monument of the country on October 12, 1922. Height of the tree 13.6m, trunk lap 10.6m. 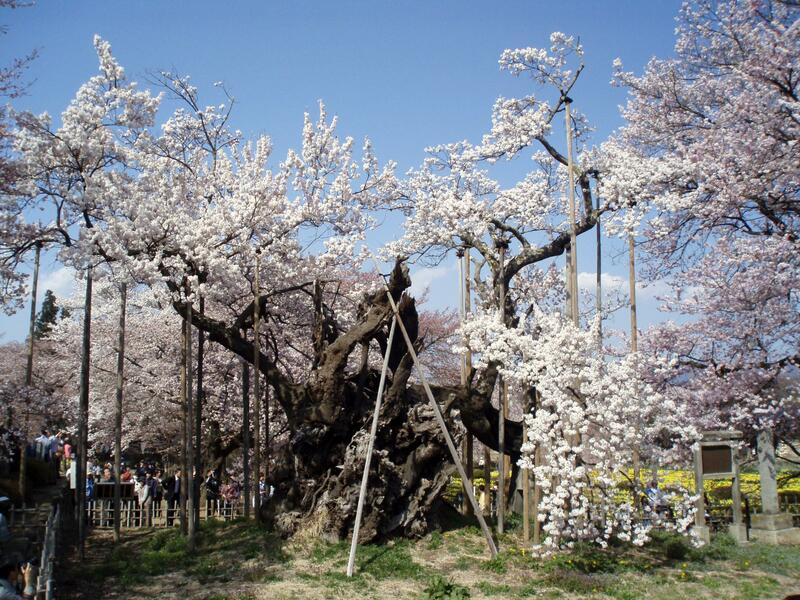 A giant tree of the maximum grade oldest in Japan. Oh, Ruma, these are too glorious for words...may I please use them for my blog header? I like to switch it around from time to time. Please, please, please...I will let everyone know it is your incredible photography! The sky is blue, the grass is green and a sweet scent is in the air. Life is good. Thank you for the taste of Japanese Spring. Ein trüber Tages-Anfang mit Regen und Wind. Die Natur ist in diesem Jahr verspätet, der Frühling wird aber auch bei uns kommen. Deine Kirschen-Blüten sind sehr schön ich, liebe diese Blumen. Mis excusas, últimamente me despiste un poco. Preciosidad de floración del cerezo. Por aquí España, ayer 20 de Marzo sobre las 18 PM, pasamos a la primavera. En España, Zona Valle del Jerte (Extremadura, cerca de Portugal), también comenzara su floración el cerezo, es un espectáculo, enorme mente atractivo, tiene una gran atracción turística. My apologies, I say goodbye a bit lately. Over here Spain, Tuesday March 20 on the 18 PM, we went into the spring. In Spain, Jerte Valley Area (Extremadura, near Portugal), also began flowering cherry, is a spectacle, great minds attractive, has a great tourist attraction. Happy Spring to you Ruma!!!!! Spring is coming everywhere Ruma.. I love your photographs of your beautiful country..
Those gardens and landscapes are amazing..
Como siempre, un palcer pasar por tu espacio. Un abrazo en esta mañana de domingo. every since I was a little girl I have wanted to be in Japan to see this spectacle. Ruma I would love you to explain alittle about the map to me. Is that a map that shows where particular cherry trees are in flower this month. I have heard that people travel long distances in Japan to see various cherry trees in bloom and that there is a map - is this it? What gorgeous blooms the trees are just laden with blossom. yes, I agree with everyone the blossoms are to die for. Bonita tomas,en encuadre y color. Here the cherry blossoms only in our dreams. la primavera ha llegado y nuestros sentidos reviven, al igual que cada ser vivo en esta Tierra!! I watched a report on the TV saying nobody works today in Japa to to and see and shot the beautiful flowered cherry trees. That's right, It is very pretty.